Ritual of Acceptance. From left: Sister Kathleen (Katie) McGrail, OP; Associates Colleen York, Shauna Walsh, and Susie Aceto; and Sister Victoria Dalesandro, OP, Shauna’s mentor. 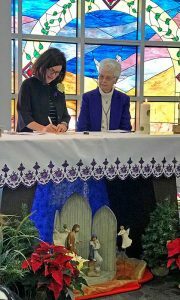 December 20, 2017, Henderson, Nevada – Shauna Walsh, long-time student, friend, and co-worker of Adrian Dominican Sisters, formalized her relationship with the Congregation on December 16 when she became the newest Adrian Dominican Associate. The Ritual of Acceptance was in the chapel in the St. Rose de Lima Campus of St. Rose Dominican Hospitals, an institution sponsored by the Adrian Dominican Sisters. Associates are women and men, at least 18 years of age, who make a non-vowed commitment to partner with the Adrian Dominican Sisters in their mission and vision. While maintaining their own independent lifestyle, Associates may take part in many social, spiritual, and ministerial activities with the Sisters. Shauna Walch signs the Agreement of Association while her mentor, Sister Victoria Dalesandro, OP, watches. 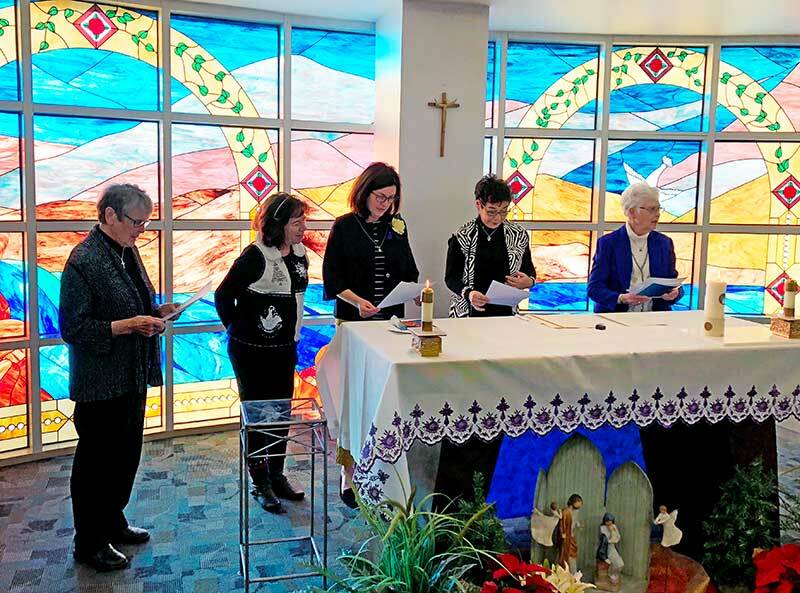 In addition to her remarks, the ritual involved the call to Shauna; the signing of the formal Agreement of Association with the Adrian Dominican Congregation; her reception of the Associate logo; and a prayer of blessing and welcome by Adrian Dominican Associates and Sisters. Sister Victoria Dalesandro, OP, was Shauna’s mentor. Other Sisters and Associates who took part in Shauna’s formation were Sisters Michael Thomas Watson, OP, Xiomara Méndez-Hernández, OP, and Kathleen McGrail, OP, as well as Associates Maria “Susie” Aceto and Sharon Carelli. Shauna first met the Adrian Dominican Sisters at St. Francis de Sales Catholic School in Las Vegas, where the Sisters taught her. Since 1998 and until recently, she worked in the Communications Department of St. Rose Dominican Hospitals. She still writes articles for the hospital’s publications. Those interested in joining Associate Life should contact Associate Mary Lach, Director of Associate Life, at 517-266-3531 or mlach@adriandominicans.org. For information on becoming an Adrian Dominican Sister, contact Sister Sara Fairbanks, OP, at 517-266-3537, 866-774-0005 or sfairbanks@adriandominicans.org.